Horsham YMCA booked their spot in the semi-finals of the Peter Bentley Cup after an early scare against Lingfield. Peter Buckland returned to the dugout after a recent operation and saw his side run out 3-1 victors at The Sports Pavilion on Tuesday night to set up a last-four clash with AFC Uckfield. YM hit back from gifting Connor Wilford the opener as Alex Barbary levelled with a sweet volley before half-time. Second-half goals from Jack Hartley and Sam Schaaf late on made sure of a place for last year’s beaten finalists in the next round. Buckland said: “We did ok. Lingfield are not a bad side and like to play possession football, but it is always quite deep. I said to the boys, no-one is going to hurt you in their own half. “We wanted to keep shutting them down and wait for an opportunity and that is how it played out. “They definitely had more possession of the football than we did, but the game plan came together. 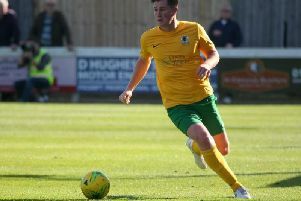 Lingfield took the lead in somewhat fortuitous circumstances on 15 minutes as Callum Donaghey gifted the ball straight to Wilford and his scuffed shot beat a diving Aaron Jeal. YM were level just past the half-hour mark as a move from the back saw Dean Carden cross from the right and Barbary volley home. The visitors took the lead on 59 minutes when a corner wasn’t cleared and Hartley turned his defender and found the bottom corner, before Schaaf headed home a Tony Garrod cross with four minutes to play. Horsham YMCA: Jeal, Carden, Donaghey, Gill, Evans, Nwachukwu (Brown 66), Gedling, Dugdale (Cave 79), Hartley (Garrod 86), Schaaf, Barbary.